This fluorescent rope is bright and vibrant in normal conditions, and appears almost electric under a blacklight. Currently available in your choice of�7 colors - blue, lime green, orange, pink, tangerine orange, white or yellow. At 6mm in diameter, this fluorescent rope is suitable for a variety of applications. GloLine is perfect for arts and crafts, stage performances, Night clubs, and you can even make sculptures out of this stuff. This is not your typical "glow rope". 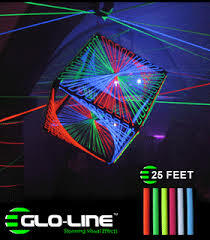 Glo Line fluorescent rope is actually hollow making it possible to use as a casing over a pliable material...a coat hanger for example. String it tightly across a room and create the perfect illusion of laser beams. Construct a spider web for Halloween. The possibilities are endless! This product takes on the true meaning of versatile! Currently available in your choice of 7 colors - blue, lime green, orange, pink, tangerine orange, white or yellow.